← You Know What I Blame This on the Downfall Of? If you’ve looked at the tracklist for the upcoming They Might Be Giants album, you might have noticed a song in the list called “They Might Be Duende.” I haven’t heard of this song being leaked yet, and a search for it yields only one result, so I’m not sure anyone not involved with the band knows what it’s about for sure. Looking up the term “duende,” however, it turns out to either be a kind of fairy or the spirit brought out by music and sometimes other sorts of art. The former definition came first, with the latter derived from it and introduced by Federico Garcia Lorca in the thirties. Since the two Johns who make up TMBG strike me as more Art Guys than Mythology Guys (hey, their song “Thunderbird” was about cheap hooch, not the creature of Native American folklore), I wouldn’t be too surprised if their song turns out to be about the latter meaning. Since I’m more of a Mythology Guy, though, I’m going to look at the original definition. Interestingly, the first time I can remember coming across the term was in The Deadly Desert Around Oz, written by Chris Dulabone. He spells it “Duendi,” but it’s obviously the same sort of being. The Duendi in the story is eight inches tall and lives in some bushes near the Emerald City. She explains that she is capable of working magic, but only if it isn’t for her own benefit. When Corky the Cranky Crocodile approaches her with a cactus from Ozma’s palace, the Duendi animates it with a Spanish spell, not realizing that it is the enchanted form of the old Nome King Ruggedo. Stories of duende come originally from Iberia, and spread to lands colonized by the Spanish and Portuguese, which means mostly Latin America and the Philippines. I don’t know of any specific physical characteristics shared by all duende, but they’re typically thought of as diminutive, a typical but not universal trait of fairies. And as in most fairy lore, some are good and some are bad, but most more or less neutral. 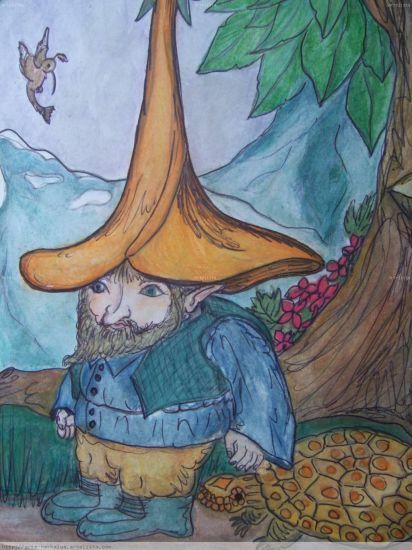 Some cultures think of duende as luring children into the woods so they’ll get lost, while others regard them as helping children find their way back home. I guess sometimes only a duende can get you out of a situation caused by a duende. Some inhabit wild places, while others live in the walls of houses, often collecting the toenails of children. Hey, everyone has a hobby, right? The word apparently actually derives from a term for “home,” reinforcing the idea of duende as household spirits. From the information I’ve managed to gather online (which really isn’t a whole lot), there isn’t a whole lot to distinguish duende from other sorts of fairies, but I suppose they do show just how widespread fairy lore is. This entry was posted in Characters, Chris Dulabone, Iberian, Music, Mythology, Oz, Oz Authors and tagged corky the cranky crocodile, duende, fairies, federico garcia lorca, gnomes, join us, nome king, the deadly desert around oz, they might be giants. Bookmark the permalink. Yep, the name comes from “home”, but more specifically from duen de casa, “master of the household”. I guess that implies the original duendes were the first owners so worried about what would happen to their houses after they died that they decided to come back and haunt them permanently. These days, duende is just used for any dwarf or male fairy.